This blog will show you how simply standing still with your dog before you enter the ring can lead you to a winning performance. The trick to all ringcraft is about your stature in relation to your dog. As I have argued in many of my previous posts, the relative success or failure of dog handling is absolutely dependent on you adopting – and being recognised – as the TOP DOG. 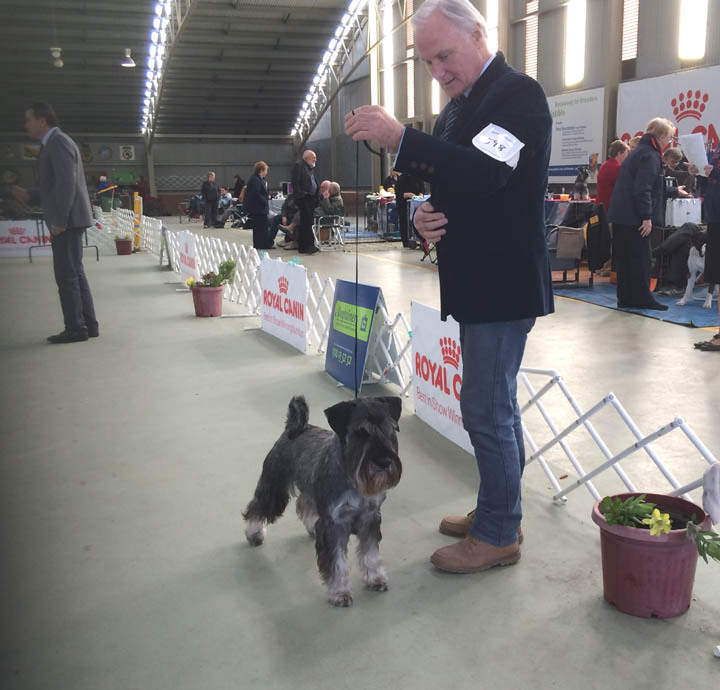 Here I will show you how simply ‘consciously’ standing still with your dog in the assembly area just before entering the ring is one easy way of reinforcing your position as the TOP DOG i.e. ‘the leader of the pack’. If you follow this guide, when the steward calls you into the ring, your dog is far more likely to respond to your signals and present their breed characteristics to maximum class winning effect. When standing in the assembly ring, rather than just ‘hanging about’, ask your dog to pay attention and remain by your side without moving and – I deliberately emphasise this point – letting them stand on a loose lead. If you can do this, then when you signal your dog to action, that is, to move into the ring – the response your dog should give you is one of eager enthusiasm and a willingness to please. If you can master this one simple trick, then I promise you that your dog will enter the ring in full animation. 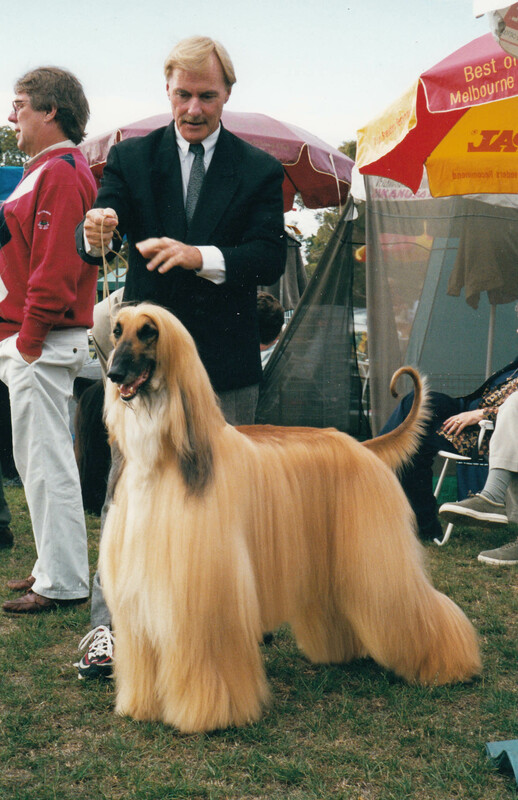 And, there is nothing more pleasing to a judge than a happy, high performing, quality dog who enters the ring in its full and natural, ideal breed-mandated state. Okay, you might ask, how might something as simple as asking my dog to stand still before entering the ring achieve this wondrous result? Well, once you understand the philosophy of the TOP DOG, it’s simple. However, if you don’t understand the hierarchical structure of canine life based on the philosophy of the TOP DOG, then your dog will assume that they’re ‘in charge’ of the situation. As a result, your dog instinctively feels that they’re responsible for making pack decisions, leaving your control limited to force via less effective mechanical aids, such as the lead. Once this happens, your dog’s show performance is based on one of non- cooperation and resistance, punctuated with your dog doing what comes naturally such as sniffing, chasing, playing, resisting stacking or any one or these culminating in anything but the showing performance you’d hoped for. Now your time in the ring is consumed with trying to make corrections to your dog’s performance. This lack of co-operation distracts you from showing the Judge your dog’s best features. When carried out correctly, applying the stand still approach is the least strenuous way of establishing that you are the TOP DOG. The object is to have your dog stand still by your side quietly and calmly without physical restraint (that means no tension on the lead), and the lead remaining loose when there is no challenge and is not pulled when there is. I call this ‘blocking’. Blocking occurs when the length of the lead is just short enough so if your dog attempts to pull away there is tension, yet still long enough so there is none when they’re standing still. Now here’s the trick: If your dog tries to pull away do not pull them back. If you do, then you will make your dog pull in the opposite direction, which undermines your leadership. All you have to do is be persistent and consistent –and if you don’t give up, you’re your dog eventually will. Now that you’ve confirmed your position as TOP DOG, your dog is now far more likely to respond to your signals and act accordingly for you – not because of you. This is massive gain just from standing still. Try it yourself. You’ll be amazed at how it can improve your dog’s ring performance. How do you stop a dog from sniffing the ground if you cant pull on the lead, also how do you stop them from lagging behind in the ring when you run them. Re your problems with sniffing and lagging behind, I have written a number of Blogs on these subjects (if you go to the Blog home page) which may go someway to helping you. These are not absolutely detailed (written as Blogs) but do have a book coming out soon which covers in much more detail on these subjects. If I can be any more help please do not hesitate.